Chile's average per capita GDP growth of 4.1% during 1991-2005 was significantly higher than average world growth during the same period and was a strong break from its own past. How much of Chile's recent growth is trend growth and how much is cyclical, influenced largely by external conditions? Which are the main determinants of Chile's long-term growth and cyclical fluctuations, according to the recent empirical literature? Which are the country's main growth strengths and weaknesses, and, based on the latter, which are the policy reforms advocated by recent technical studies and campaign proposals? This review article addresses the latter questions, starting with the facts about Chile's average growth and growth volatility at the aggregate, regional, and economic-sector level. Then the paper surveys trend growth studies for Chile that range from decomposition by sources of growth to econometric and simulation studies of deep growth determinants, based on international panel-data and national time-series evidence, and on research focused on individual reforms. Studies on short-term output fluctuations and cyclical recoveries in Chile, also comprising cross-country and national time-series evidence, are presented next. This issue of Cuadernos publishes six new, relevant research papers on Chile's growth, which are briefly introduced. Then the paper reviews selectively growth-enhancing policy proposals that have been put forward by academic authors, international organizations, and presidential candidates in their 2005 campaign programs. An epilogue with brief thoughts about Chile's growth potential and policy reform challenges closes the paper. Keywords: Economic Growth, Productivity, Chile, Growth Policies, Structural Reform. it is hard to think about anything else"
is to lift the economy's growth potential"
Chile grew at an average per capita GDP rate of 4.1% during 1991-2005, breaking with its past mediocre growth performance of barely 1.5% recorded from its independence (1810) to 1990. The country's high growth during the last 15 years also exceeds significantly the world's average per capita growth during the same period (at 1.4%) and that of most individual countries and regions. How much of Chile's recent growth is trend growth and how much is cyclical, influenced largely by external conditions? Which are the main determinants of Chile's long-term growth and cyclical fluctuations, according to the recent empirical literature? Which are the country's main growth strengths and weaknesses, and, based on the latter, which are the policy reforms advocated by recent technical studies and campaign proposals? This article addresses the latter questions, motivated by Lucas' intellectual obsession with growth and the OECD's key policy prescription for Chile that I have quoted above. In section 2, I revise the facts about Chile's average growth and growth volatility at the aggregate level (contrasting the recent past to Chile's history and to international experience) and describe the country's growth performance at regional and economic-sector levels. Then I review the literature on trend growth in Chile, ranging from decomposition by sources of growth to econometric and simulation studies of deep growth determinants, based on international panel-data and national time-series evidence, and on research focused on individual reforms. In section 4, I review research that has analyzed short-term output fluctuations and cyclical recoveries in Chile, also comprising cross-country and national time-series evidence. This issue of Cuadernos de Economía publishes six new and relevant research papers on Chile's growth, introduced in section 5, that focus on trend growth determinants, regional growth convergence, aggregate TFP determinants, economic sector-level TFP dynamics, and the behavior of manufacturing-sector TFP using plant-level and sub-sector data. Section 6 is devoted to a selective review of growth-enhancing policy proposals made by academic authors, international organizations, and presidential candidates in their 2005 campaign programs. I close the paper with brief thoughts about Chile's growth potential and major policy reform challenges. Chile has recorded an impressive economic expansion during the last two decades, reflected in 4.8% average annual growth of per capita GDP from 1986 to 2005. The period after 1985 was also exceptional regarding booms and busts, featuring only one recession of moderate magnitude in 1999. Chile's relative output stability during 1986-2005 is reflected in a moderately low standard deviation of per capita GDP growth, at 3.1%. This favorable combination of a high first moment and a low second moment of growth is exceptional in Chilean economic history. Chile's average per capita GDP growth has been only 1.7% in the period spanned from 1810 through 2005 - the country's full history as an independent nation. And Chile's long-term growth volatility -at a 6.3% standard deviation of per capita growth from 1810 to 2005- doubles the above mentioned figure recorded during the last 20 years. 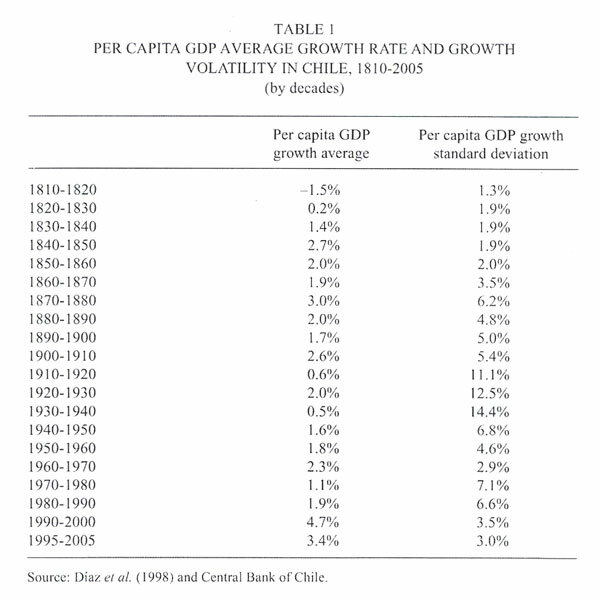 A more detailed account of growth rates and growth volatility for all of Chile's independent history is summarized in Figure 1 and Table 1. After low growth in the first three decades that followed independence, Chile attained per capita growth that averaged 2.3% between 1840 and 1910. Growth instability rose almost monotonically throughout the 19th century, peaking at 6.2% during the 1870s. 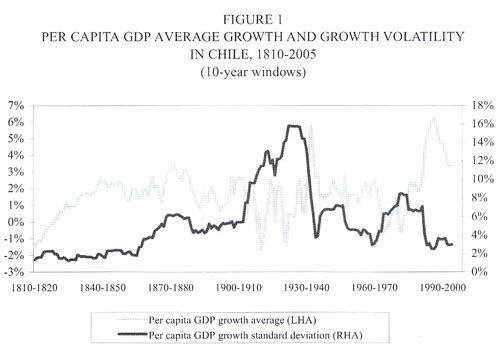 Average growth fell massively and growth volatility rose dramatically between 1910 and 1940 -the worst three decades in Chile's growth history. The Chilean economy, highly open to the world economy and lacking stable domestic institutions and policies, suffered from external and domestic shocks and rising domestic economic and political instability between the World War I and the early 1930s. Deteriorating external conditions -associated to World War I, the declining world demand for Chilean nitrate, and the subsequent Great Depression- led to the deepest recorded GDP loss in the world -Chile's- between 1930 and 1932. Adverse foreign shocks, combined with domestic institutional instability, resulted in misguided and unstable economic policies that led to financial crises and government coups during the 1920s and early 1930s, exacerbating economic uncertainty and output instability. Source: Díaz et al. (1998) and Central Bank of Chile. As a response to the Great Depression and in tandem with a closing world economy, Chile adopted an import-substitution strategy based on government-led industrialization.1 Starting in the mid-1930s and increasingly until the mid-1970s, successive governments strengthened their role in resource allocation and property, broadened market interventions, expanded social policies and government transfers, and engaged in largely destabilizing macroeconomic policies. After a short period of high growth that characterized the post-Depression recovery, average per capita growth attained just 1.4% between 1938 and 1973, with a standard deviation of 5.1%. The government-led development strategy peaked during the 1970-1973 period of "Chile's road to socialism", when government intervention, economic mismanagement, and socio-political conflict were reflected in large uncertainty and stagnating growth. The ensuing coup and military dictatorship led to a U-turn in development strategy, with the adoption of market-based institutions and policies, gradual macroeconomic stabilization, large-scale privatization and market deregulation, and integration into the world economy. However, as a result of severe domestic policy mistakes and two major international recessions, average growth was modest between 1974 and the mid-1980s, while growth volatility was very high. Yet the structural reforms of the 1970s and 1980s paved the way for the high growth recorded during the last two decades. Macroeconomic stabilization and structural reforms were deepened by the successive governments that have ruled Chile since the return to democracy in 1990. Therefore it is hard to dispel the notion that Chile's recent growth record -exceptional by its own historical standards- is related to the broad policy framework that has been adopted since the mid-1970s. However, before jumping to easily to the latter conclusion, let's review Chile's growth record in international comparison - an exercise that is particularly relevant when considering that Chile's small economy is highly dependent on world economic conditions. Chile's uneven growth history is confirmed in international comparison. 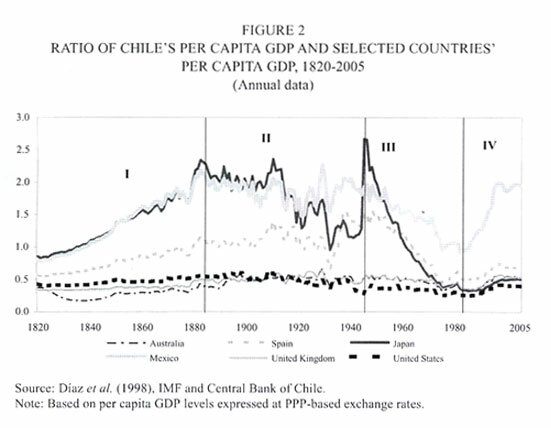 Figure 2 depicts Chile's per capita GDP level relative to per capita GDP levels of six representative economies during the last 185 years.2 While Chile's relative performance is somewhat dependent on each individual country,3 a common average pattern regarding Chile's relative growth performance is apparent. Considering the full 1820-2005 period, Chile's relative GDP ended up in 2005 at a similar or slightly lower level than in 1820, in comparison to the five currently industrialized countries (Australia, Japan, Spain, the US, and the UK), improving only relative to Mexico. This may be representative of Chile's general historic growth record -growing more than most developing economies but somewhat less than industrial countries. Chile's almost two centuries of independent economic performance can be roughly divided into four periods of growth convergence and divergence. The country was on a path of income convergence during much of the 19th century, from 1820 until ca. 1880. During the second phase, from the 1880s until 1930, Chile's relative output performance stagnated on average vis-à-vis the rest of the world, particularly in comparison to Australia, the US, and the UK. The Great Depression started the third growth phase that lasted until the mid-1980s, a long period during which the Chilean economy featured unambiguous growth divergence, losing relative weight in the world economy.4 Chile's relative GDP fell from 1930 to 1983 vis-à-vis all countries, a decline that ranges from 0.54 to 0.36 in comparison to the UK and from 1.57 to 0.34 compared to Japan. The past 20 years of exceptional growth are confirmed in international comparison. During this fourth growth phase Chile records a vigorous relative GDP improvement in comparison to all six countries. However, Chile's relative improvement is not monotonic. After major convergence during the "golden years" of high growth 1986-1997, the 1997-1998 Asian crisis and its aftermath affects Chile's growth performance more negatively than that of comparator countries. Only more recently -since 2004- Chile's relative GDP position starts to improve again. Yet considering the full 1985-2005 period, Chile's relative GDP rise ranges from 0.25 to 0.4 compared to the US and from 0.97 to 1.96 relative to Mexico. The ratios between Chile's per capita GDP level relative to those of the world, Latin America and the Caribbean (LAC), and the US are depicted for 1960-2005 in Figure 3.5 Table 2 (upper half) reports per capita GDP growth rate averages for Chile, LAC, the East Asia and Pacific (EAP) region, Japan, the US, and the world, during 1961-2004 and sub-periods. The pattern discussed above is confirmed here. Chile's economy diverged by growing less than most countries and regions from the 1960s through the mid-1980s, and subsequently converged by growing more from the mid-1980s to 2005. 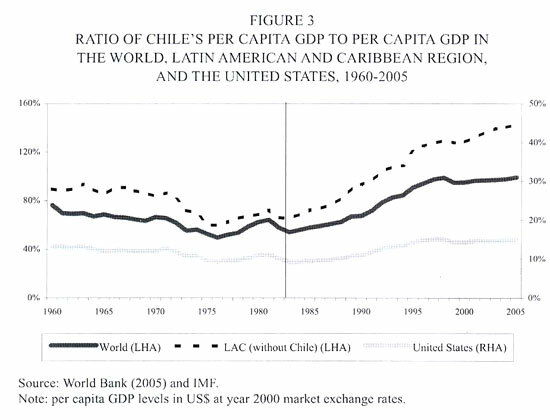 Relative to world (LAC) per capita GDP, Chile's per capita GDP fell from 76% (90%) in 1960 to 55% (65%) in 1983, subsequently recovering to attain 99% (143%) in 2005. The exception to the previous pattern is Chile's performance compared to EAP, where per capita growth has been systematically higher than in Chile, including the last 20 years. Similar results are obtained when comparing Chile's growth volatility to the growth volatility recorded in major regions (Table 2, lower half).6 Chile's increasing stability is reflected by a large decline in the standard deviation of per capita GDP growth in 1991-2004, in comparison to the growth volatility observed in the 1970s and 1980s. This evolution of Chile's second moment of growth is favorable compared to LAC's and EAP's, where growth volatility rose in 1991-2004, but is similar to the increased stability observed in industrial countries (the US and Japan) and the world at large, during the same time span. 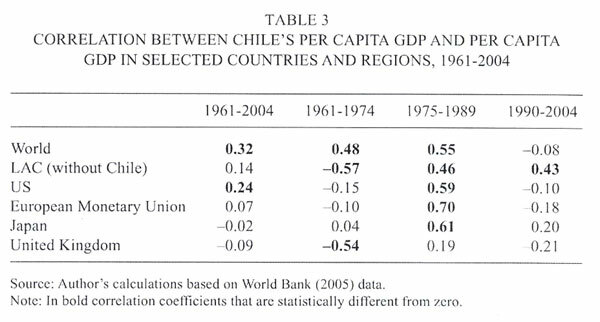 The correlation between Chile's and the world's per capita GDP growth declined (statistically) to zero during 1990-2004, in comparison to the positive significant correlations -close to 0.5- observed in 1961-1974 and 1975-1989 (Table 3). The change in correlations between Chile's per capita GDP growth and that of individual industrial countries and the Eurozone is even stronger, reflecting significant delinking between Chile and industrial economies since 1990. However, the opposite pattern is observed in Chile's growth correlation with LAC, which shifts from negative and significant in 1961-1974 to positive and significant during the past three decades. A well-known stylized fact about growth in the world is the negative correlation observed between the first and second moment of growth in large cross-country samples (Ramey and Ramey, 1995, Calderón et al., 2006). Using the most recent cross-country data available, I report the relation and corresponding regression between average per capita GDP growth and the standard deviation of per capita GDP growth across 150 countries in 1961-2003 and two sub-periods (Figure 4). The negative correlation between average growth and growth volatility is confirmed for the full sample period and also separately for its two halves, with significant slope coefficient estimates. In fact, the negative correlation between growth and volatility has increased in magnitude since 1984. 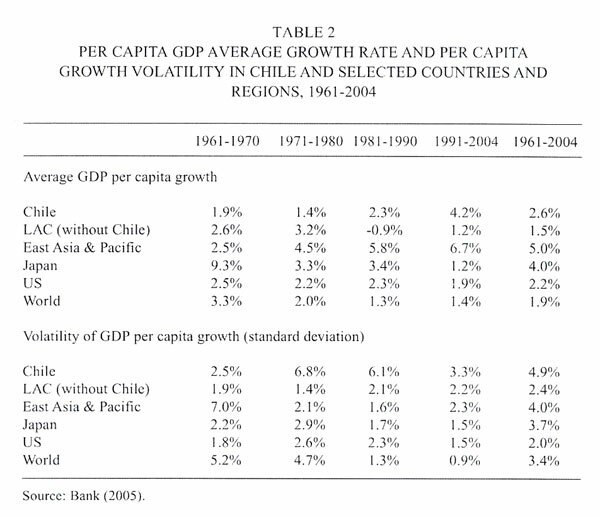 Chile's average per capita growth rate (at 2.6%) and per capita growth volatility (at 4.9%) were above average world growth (1.9%) and world growth volatility (4.6%) during the full 1961-2003 period (Figure 4).7 However this overall pattern hides very different performances during the first and second halves of the above mentioned period. Average growth was lower and growth volatility was higher than the corresponding world figures during 1961-1973. The opposite pattern is observed in 1984-2003, when Chile recorded more growth and less growth volatility than the world on average. During the first period, Chile's growth-volatility combination was close to that of a representative developing country but much worse than that of an average industrial country. The opposite is observed in the second period, when Chile's growth-volatility mix is somewhat better than that of a representative industrial economy and dominates by far the combination observed in an average developing nation. Economic concentration in Chile's Santiago Metropolitan region (Región Metropolitana, RM) is reflected by its growing share of Chile's GDP, rising from 41.5% in 1960 to 46.0% in 2000 (Figure 5). Hence centralization has implied that Chile's 12 regions other than RM have, on average, lost economic weight for the past 50 years -and probably since the start of independence- mainly as a result of migration to and industrialization in Santiago. However, major changes in relative economic weight have taken place among the 12 regions during the past half century. Since the start of trade opening in the mid-1970s and the opening up of mining to foreign investment in the early 1980s, the regions endowed with significant natural resources (mining, fisheries, and suitable land for forestry and agriculture) saw large private investments and grew significantly through exports. This was the case of the four Northern regions and, to a lesser extent, regions VII and X since 1980. In contrast, regions V, VIII, and XII had relative large shares of import-substituting manufacturing in the 1960s and early 1970s, suffering from subsequent trade opening, reflected in their declining GDP shares. 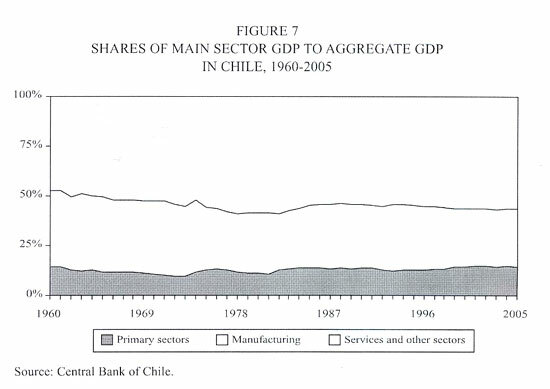 Now let's turn to the economic-sector composition of Chile's growth during the last half century. At a very aggregate level -distinguishing between primary, secondary, and tertiary sectors- growth has been relatively balanced (Figure 7). The relative share of the primary sector (agriculture and livestock, fishing, and mining and quarrying) has risen from 12.3% of GDP in 1960 to 14.5% in 2005, the secondary sector (manufacturing) has declined from 20.1% in 1960 to 17.1% in 2005, while the tertiary sector (services and others) has increased slightly during the same time span, from 67.6% to 68.4% of GDP (Table 4). This evolution is quite different from the standard international development experience, particularly that of high-growth countries, where the relative size of the primary sector shrinks quickly, manufacturing's share may rise and then decline, and the tertiary sector share grows continuously. Again, the explanation for Chile's different development pattern lies in its adoption of an outward-oriented growth strategy since the mid-1970s, based on developing natural-resource intensive activities in the primary sector and in resource-processing manufacturing sub-sectors. Therefore the share of mining (largely copper) in GDP has risen from 6.8% in 1960 to 8.1% in 2005, the share of fisheries has increased its share by five during the same period, attaining 1.5% of GDP, while agriculture and livestock has declined only between 1960 and 2005, achieving 4.9%. Digging deeper within the tertiary sector, large changes in the relative size of individual service and other sectors are evident since 1960. Substantial government downsizing since the mid-1970s and through the 1990s explains the massive shrinkage of public administration, from 9.7% of GDP in 1960 to 3.6% in 2005. Large-scale privatization of public enterprises in transport, communications, and public utilities and the subsequent growth of private enterprises, complemented by auctions of infrastructure investment to the private sector since the 1990s, is behind the explosive growth of transport and communications (more than doubling its size, from 3.7% in 1960 to 8.8% in 2005) and of gas, electricity, and water (rising from 1.9% of GDP in 1960 to 3.2% in 2005). Privatization of public financial institutions and financial liberalization since the mid-1970s also led to explosive growth in banking, more than tripling its GDP share from 3.8% in 1960 to 13.7% in 2005. Privatization and foreign trade opening contributed also to the rise in the share of wholesale and retail trade. Hence the sector structure of Chile's economy has changed drastically during the last three decades, as a result of deep structural reforms applied since the mid-1970s and through the present. 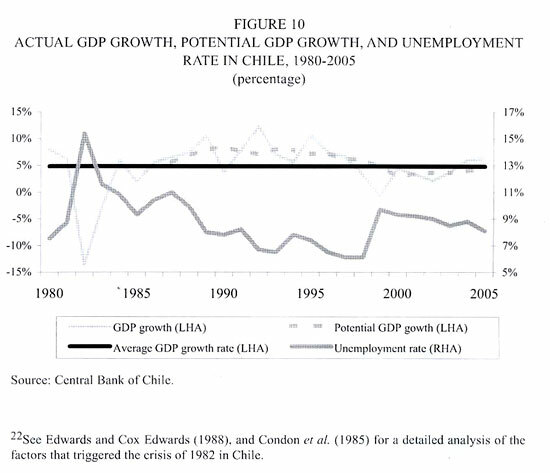 Chile's economic growth performance from 1985 to 1997 was remarkable indeed. After an average annual GDP growth of 1.5% (0.5% in per capita terms) during the 15 years spanned between 1970 and 1984, the country grew at an average 7.6% (5.9% in per capita terms) between 1985 and 1997. This so-called "golden period of growth" in Chile has been the subject of several studies that conclude that high growth in this period was a successful result of market-oriented structural reforms (e.g. Gallego and Loayza, 2002). The subsequent performance was less outstanding, as average annual GDP growth declined to 3.5% (or 2.2% in per capita terms) between 1998 and 2005. The changes in Chile's growth performance during the last 35 years are confirmed in international comparison (Figure 8). Chile displayed dismal growth during 1970-1984, growing by half the LAC average and by significantly less than the world average.9 In contrast, Chile's 7.6% annual growth during the "golden period" was close to EAP's, and more than doubled average growth in any other major world region. Although Chile's GDP growth fell significantly, to 3.1%, in 1998-2004, it still outperformed most of the major world regions, except EAP that grew at more than twice the latter figure. The most recent years, since 1998, span a period that coincides with a full business cycle. The 1997-1998 Asian crisis triggered a sharp cyclical contraction in 1998-1999 in Chile (with average GDP growth of 1.2%) that was followed by a slow cyclical recovery in 2000-2003 (with growth at 3.3%), and a strong recovery toward full employment in 2004-2006 (with average growth projected at 6%). This description leads straight into distinguishing between trend growth and growth cycles -and their determinants-, the subject of the following two sections. The latter distinction is important because it filters out the cyclical component of growth in any given period. For example, the 7.6% figure of average GDP growth during the "golden period" reflects in part cyclical recovery, starting in 1984 (when actual output fell very short of potential output, and labor unemployment was very high) and ending in 1998 (when output was close to potential and labor unemployment was close to its natural level). This traditional method consists in determining first the contribution of labor and capital to GDP growth, based on their output shares and growth rates, and then to estimate residually the contribution of TFP growth. There are several ways to implement this method, ranging from the choice of production function, the measurement of factor shares and factor growth, possible adjustment for factor utilization and quality, and possible inclusion of other factors of production like human capital and natural resources. 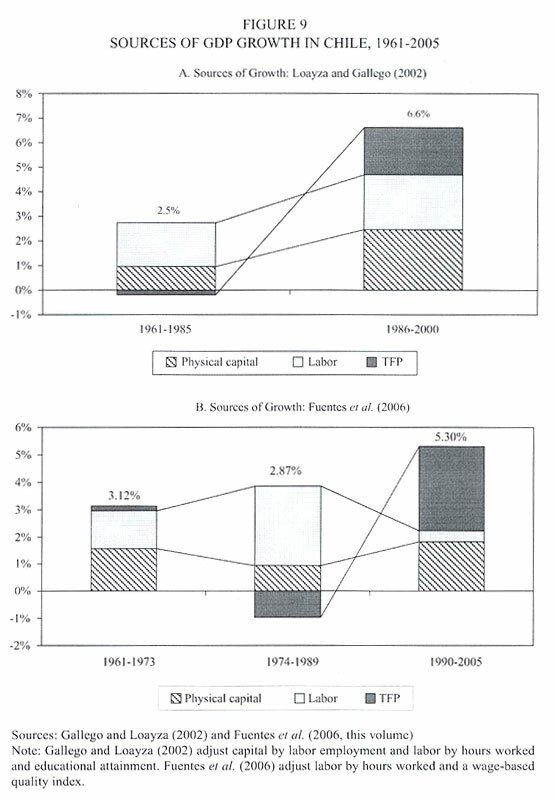 Many authors have applied the Solow decomposition to measure the proximate determinants of Chile's growth.11 For example, Gallego and Loayza (2002) document a significant change in the relative contribution of the "perspiration" component of growth (accumulation of capital and labor) and the "inspiration" component (the productivity gains reflected in TFP growth) during the last four decades (Figure 9A). Adjusting factor growth for input utilization and human capital, they find that Chile's low GDP growth of 2.5% per year recorded during the quarter century between 1961 and 1985 was largely a result of labor accumulation and, to a lesser degree of physical capital growth. Residual TFP growth was close to nil during the same time span. This performance stands in marked contrast to the subsequent high-growth period of 1986-2000, when average GDP growth -at 6.6%- is explained by factor accumulation and significant efficiency gains. Fuentes et al. (2006, this issue) extend the previous measures both in time and by separating sub-periods by those years in which they estimate that actual GDP was close to its potential level, in order to avoid measurement bias of trend-growth sources stemming from cyclical components. Dating those (close to) full-employment years as 1973 and 1989, the authors report results for three sub-periods of similar length, similar cyclical features, and broadly coinciding with distinct periods of political and economic regimes: 1960-1973, 1974-1989, and 1990-2005 (Figure 9B). "Perspiration" explained almost all the mediocre 1961-1973 growth rate (3.1%), hence "inspiration" was close to nil. Even worse, the level of TFP declined during the 1974-1989 period of low growth (2.9%), when labor accumulation contributes the most. During the last 16 years from 1990 to 2005, growth was relatively high, at 5.3%, and more than half of it (3.1%) is due to productivity gains. Capital investment also contributes substantially while labor growth contributes the least. These results confirm the previous findings that Chile's higher growth since the mid-1980s is largely due to larger TFP growth, followed by the contribution of capital accumulation deepening. However, one should be careful in identifying shorter sub-periods within the last two decades, during which TFP growth exhibits a significant pro-cyclical behavior (Fuentes et al., this issue). Growth analysis based on sources of growth sheds some indirect light on the policies that should be pursued to raise growth. For example, considering that many international studies conclude that TFP is the main source of growth (e.g. Easterly and Levine, 2003) -a relevant hypothesis for Chile's experience since the mid-1980s, as discussed above- one may conclude that policies and institutions aimed at increasing productivity and innovation should be preferred over policies designed to raise, say, saving rates. However, the links between deep determinants, such as policies and institutions, on the one side, and sources of growth, on the other, are complex. Multi-causal links are observed between deep determinants, sources of growth, and GDP growth itself. Potential interactions among deep growth determinants, and between them and the sources of growth, may trigger trend growth jumps. Positive interactions between structural change, factor accumulation, and efficiency gains, with ultimate positive feedback from output growth and higher income levels back to good policies and institutions, may start a prolonged period of high growth. And the converse -a low-growth trap- is perpetuated when a critical mass of high-quality policies and institutions cannot be attained. The quality of institutions, defined in a broad sense, has been identified as a main determinant of economic growth. The large changes in institutional design and quality implemented in Chile during the last three decades is therefore a serious candidate in explaining the rise in growth. Corbo et al. (2005) find that the quality of institutions -voice and accountability, political stability, government effectiveness, regulatory quality, rule of law, and control of corruption- explains one half of the difference in development between Chile and LAC during 1960-2000. Calderón and Fuentes (2005a) estimate that more than 20% in the growth increase between 1981-1985 and 1996-2000 was caused by better institutions. Moreover, the latter estimations could under-estimate the effects of institutions, as the latter have also a positive effect on policy determinants, particularly financial liberalization (and subsequent financial deepening) and macroeconomic stabilization (and subsequent fiscal sustainability and low inflation). Several policies or policy variables have been identified as candidates to explain the Chilean growth success. Traditionally, they have been classified into stabilization and structural policies. Inflation levels, public deficits, and real exchange rate misalignments (or black-market exchange rate premiums) have been used as proxies for macroeconomic stability (or the lack thereof). Chile has achieved a major and possibly persistent success in gradually conquering macroeconomic stability during the last three decades, after a century-old history of rampant macroeconomic instability. Under the inflation-targeting regime adopted by Chile's strongly independent Central Bank since 1991, inflation has been reduced to levels observed in industrial countries, after registering double (and triple) digit inflation for many decades. Successive governments have achieved fiscal surpluses during the last decades, a policy institutionalized by a 1%-of-GDP structural public sector surplus adopted since 2001. Full elimination of foreign exchange controls and adoption of a floating exchange-rate regime since the late 1990s precludes existence of black market exchange premiums and avoids real exchange rate misalignments that arise from exchange-rate management. Structural policies and policy reforms have played a crucial role in Chile's growth acceleration.15 As mentioned above, Chile implemented a large array of deep structural reforms in many areas since the mid-1970s. Among the latter are domestic financial liberalization and capital-market development, trade and financial integration into the world economy, public sector restructuring and state-owned enterprise privatization, sector deregulation and opening-up to private investment, and adoption of social policies aimed at reducing poverty and improving equal opportunity. Progress in these and other areas was neither uniform nor monotonic, but the general trend over the course of the last three decades has been toward adoption of structural policies better suited to attain higher growth and better social opportunities. In a pioneering early study, Harberger (1959) estimated that eliminating all distortions that characterized Chile's pre-reform situation of the 1950s would result in static output gains reflected in higher growth (by 1-2% per year), for a limited period of time.16 In more recent work, Schmidt-Hebbel (1998) and Corbo and Schmidt-Hebbel (2003) find statistically significant effects of an aggregate index of structural reforms on TFP growth between 1960 and the late 1990s. In international panel studies, Calderón and Fuentes (2005a) and Loayza et al. (2004) estimate that more than half of Chile's growth acceleration since the mid-1980s is explained by structural policy improvements. Several studies relate specific policy improvements to Chile's aggregate growth -I refer to them subsequently. On trade liberalization, 17 Rojas et al. (1997) estimate that 1.5% of Chile's annual growth between 1986 and 1996 was due to the increase in international trade. Herzer (2004) finds that export diversification has played an important role in increasing growth. Pardo and Meller (2002) analyze the effect of exports on regional growth, reporting that export-oriented regions converge to steady-state per capita GDP levels. Several studies investigate the effects of free trade agreements (FTAs) signed by Chile in recent years. Their results, which depend critically on the levels of multilateral tariffs, range from long-term GDP level gains of 0.3% to 10.0% of GDP for Chile's FTA with the U.S.18 Chumacero et al. (2004) consider both FTAs adopted with the European Union and the U.S., reporting an estimated steady-state gain of 1% for the level of GDP. Bergoeing et al. (2002a and 2002b) compare Chile and Mexico's growth performance after both countries experienced deep crises at the start of the 1980s. Crisis recoveries were very different, with Chile attaining growth earlier and faster than Mexico -Figure 2 shows that Chile almost doubled Mexico's per capita GDP during the last two decades. The authors argue that this difference was due to the different timing of structural reforms in both countries- in particular reforms of banking and bankruptcy law -which had a significant effect on TFP growth in Chile. Bergoeing et al. (2005), using Chilean plant level data on manufacturing firms, conclude that their adoption of better technologies and production processes during the 1990s were fostered by broader foreign exposure and superior access to external finance. Lagos and Díaz (1992) find a negative effect of financial repression on growth for the 1965-1974 period. Hernandez and Parro (2005), using the cross-country results by Levine et al. (2000) and Beck et al. (2000), estimate that Chile's financial liberalization and development contributed by 1.5% to annual growth between 1961 and 2001, and by 0.4% to annual growth between 1986 and 2001. There is scarce evidence that provides quantitative links between education and growth, and research and development and growth. In early work, Selowsky (1969) estimated that education in Chile contributed by 0.7-1.1% to annual growth during 1950-1964, and by 1-1.2% during 1960-1964. Fuentes and Vatter (1991) and Benavente (2005) provide a qualitative analysis on the contribution of research and development to growth in Chile. Policy interactions have been identified as an important contributing factor to the acceleration of economic growth -worldwide and in Chile. The argument is based on the notion that growth benefits of comprehensive structural reforms, that attain a critical mass of reform progress in many or most policy areas, could extend well beyond the sum of partial effects of individual reforms, as a result of positive and significant reform interaction effects. For example, trade and financial integration into the world economy will matter little to potential exporting firms if their property rights are not protected, if they face inadequate bankruptcy laws or lack access to domestic bank and capital-market financing, or if they are hampered by overly restrictive labor-market laws and regulations. Corbo and Schmidt-Hebbel (2003) argue that complementary policy changes, in particular fiscal and financial reforms, and privatization, were critical for the positive and significant contribution of pension reform to growth in Chile. Gallego and Loayza (2002) explore empirically policy interactions for the case of Chile, using international panel data. The authors explain only 45% of Chile's after-1985 growth acceleration when restricting their specification to conventional variables included in growth regressions.21 In order to reduce the growth residual for Chile, one of the highest in their cross-country sample, the authors expand the set of explanatory variables, including governance, public services and infrastructure, and policy complementarity. For capturing the latter, they use a dummy variable that takes a value of 1 when all measures of policy indicators for any country are above the sample median. This strategy allows the authors to raise the share of Chile's growth acceleration explained by their regression to 73% and identify the contribution of policy interactions as the most influential growth determinant. Calderón and Fuentes (2005a), also using international panel data, investigate the complementarily effects between quality of institutions and financial as well as trade openness. In both cases they find that low quality of institutions implies a negative contribution of openness to growth. As institutional quality develops, the effect of financial openness becomes positive, reaching its largest contribution close to the 60th percentile of the world institutional quality distribution, just where Chile is ranked. In the case of trade openness, where the relation is linear, the complementarity effect is also positive for Chile. Taking these effects into account, the authors are able to explain almost 90% of the growth acceleration in Chile observed between 1981-1985 and 1996-2000. Nearly 30% is explained by openness, in particular financial openness, and including interaction effects. Finally, Schmidt-Hebbel (1998) finds a statistically significant interaction between structural policies and macroeconomic stability in explaining Chile's growth. Fuentes et al. (2006, this issue) also include an index of structural policies as an explanatory variable for TFP growth. 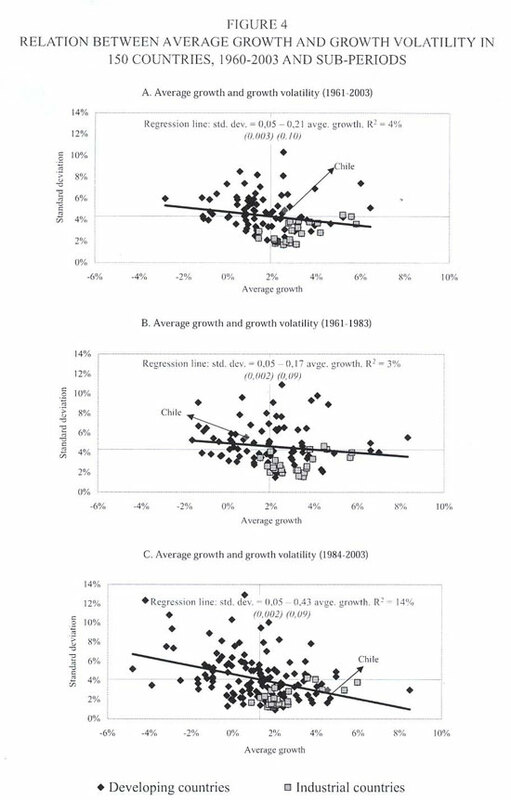 I confirmed above the negative correlation observed between growth levels and growth volatility, both across countries and over time in Chile. Fatás (2003) presents econometric evidence about the effects of business-cycle volatility on long-term growth in the world. In the case of developing countries, more vulnerable to external shocks, the recessions associated to adverse foreign shocks and the nature of subsequent cyclical recoveries have profound effects on average growth during longer horizons. Therefore when analyzing Chile's long-term growth prospects it is relevant to refer to the country's vulnerability to external shocks and its capacity to recover from recessions quickly and on a sustained basis. It is particularly relevant to identify the role of international and domestic factors in shaping recessions and recoveries. Chile suffered three recessions during the past quarter century. The deepest recession occurred in 1982, as part of LAC's debt crisis. In Chile -as in other Latin American economies- this recession was associated to a profound and generalized financial crisis.22 The second recession, in 1990, was mild and so short that it was reflected only in quarterly, not annual, data. Finally, the 1999 recession, triggered by the Asian Crisis, was of moderate intensity and did not imply a financial crisis, but was followed by a relatively slow cyclical recovery. Only after vigorous growth in 2004-2005, it is estimated that GDP will attain its potential level and labor unemployment will converge back to its natural rate during 2006 (Figure 10). Estimates for potential GDP growth show a pro-cyclical behavior, returning to 5% and slightly higher in 2005-2006. Note that the latter figure is very close to the 5.3% average annual GDP growth recorded in 1990-2005 (Figure 9) -a full-cycle period that reflects well Chile's recent potential growth over the business cycle. 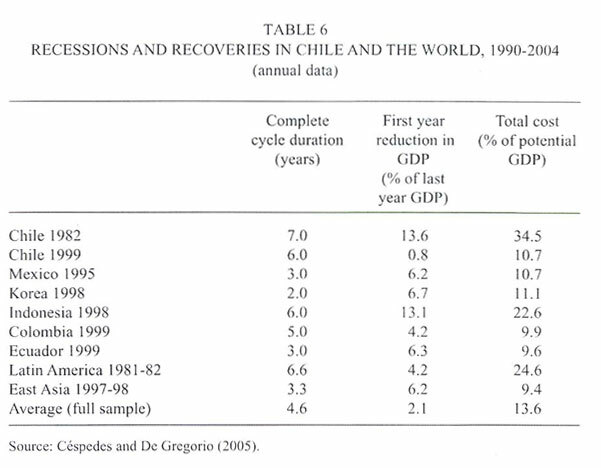 Based on defining a recession as two quarters of negative growth and applying a metric based on initial (pre-recession) GDP levels and quarterly data, Calderón and Fuentes (2005b) compare Chile's three recessions to recessions registered in 23 countries between 1990 and 2004 (Table 5). In terms of total duration (21 quarters), largest GDP decline (23.3% of quarterly initial GDP), and total GDP loss (204% of quarterly initial GDP), Chile's 1982 recession was by far the largest and longest recession included in the full international sample. Interestingly, Chile's 1999 recession was shorter, shallower, and less costly than the recessions in Mexico (1995 and 1999), Korea (1998), and average recessions in Latin America and Emerging Asia in general. However, Chile's 1999 recession was significantly deeper and more costly than the average recession in an OECD country. Using a different metric based on annual data and potential GDP levels, Céspedes and De Gregorio (2005) compare Chile's 1982 and 1999 recessions to those in a sample of emerging economies during 1990-2004 (Table 6). In terms of duration, Chile's 1999 recession was similar to the average LAC recession of 1982 and longer than the recessions registered in the rest of the world. However, the first-year GDP loss was smaller than in any other individual recession as well as in the world average. Finally, the total output cost was similar to that observed in Asian 1997-1998 and in Mexico (1995), but smaller than the output loss in the world (sample) average. The authors also compare the evolution of relevant variables before and after 1999 in Chile and selected recessions in other countries. They observe that the rise in unemployment in Chile 1999 was more persistent than in other country experiences. This could be the result of real wage rigidity in Chile, reflected in real wage growth during the 1999 recession at the same rate observed before the recession, precluding quicker absorption of unemployed labor during the recovery. Finally, the real exchange rate also exhibits only moderate adjustment during and after 1999, slowing down resource reallocation required for a faster recovery. Gallego et al. 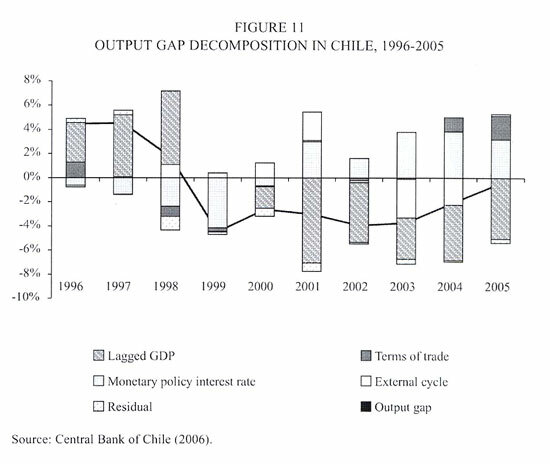 (2006) use a micro-founded dynamic general equilibrium model, calibrated to Chile, to decompose the output loss from trend observed in the 1998-1999 recession, according to the influence of international and domestic determinants. Their simulations suggest that the deterioration in foreign conditions, the contractionary monetary policy, and the cyclical fiscal policy (first expansionary, than contractionary) caused the recession. Finally, Central Bank of Chile (2006) reports an analysis that was carried out to identify external and domestic conditions in Chile's cyclical evolution during 1996-2005, including the 1999 recession and its aftermath. Borrowing an equation from the Central Bank's projection model (Modelo Estructural de Proyección), the output gap was decomposed according to the influence of international factors -terms of trade and GDP growth of trading partners- and domestic conditions -the monetary policy interest rate- , controlling for lagged effects of the latter variables and the output gap itself (Figure 11). This exercise shows that both international and domestic external conditions have played a fundamental role in the 1999 recession and its recovery. The terms of trade contributed significantly to the recovery in 2004-2005 and foreign growth contributed moderately until 2001. The effect of the monetary policy rate was exceptionally negative in 1998-1999 but contributed strongly to the recovery in 2001-2005. The research on Chile's growth carried out to date, revised in the preceding sections, has shed light on growth regularities and determinants. However, several questions remain unaddressed or require a deeper understanding. This issue of Cuadernos de Economía includes six articles that contribute substantially to the empirical research on Chile's past growth performance and future prospects. The articles focus on four areas: policy and institutional determinants of Chile's aggregate growth in international comparison, output and income convergence among Chile's regions, measurement of TFP growth and estimation of its behavior at the aggregate (national) and economic-sector level, and measurement of manufacturing-sector TFP and estimation of its behavior using plant-level and sub-sector level data. Calderón and Fuentes (2006, this issue) start by providing new evidence on world growth determinants, based on dynamic panel-data estimations for 78 countries during the last three decades. Their growth specification allows for a role of complementarities between institutional quality and financial openness and/or trade openness, in addition to considering the linear effects of each individual variable. This permits identifying possible non-linear and non-monotonic effects that will depend on the extent of complementarities. The results show that high-quality institutions lead to a larger contribution of financial and trade openness to GDP growth. The growth impact of financial liberalization is positive only in countries with strong institutions, i.e. countries above the 20th percentile in the world distribution of institutional quality. However, the relation is non-monotonic, as the effects of financial openness on GDP growth are reduced as institutional quality rises. The results show that the largest effects are observed in countries at a level of institutional quality similar to Chile's. A positive complementarity between institutions and trade openness is also estimated, but in this case the marginal effect of openness is positive at all levels of institutional quality. Then the authors use the world panel evidence to identify the main contributing determinants of Chile's growth: the quality of its institutions, financial openness, and macroeconomic stability. They infer that if Chile were to deepen reforms during 2006-2010 at their historical pace, its annual growth would rise by 0.27 percentage points above its 1996-2000 rate. Furthermore, a larger growth gain -by 0.8 percentage points- would be attained by extending reforms in education, financial market development, and trade openness. 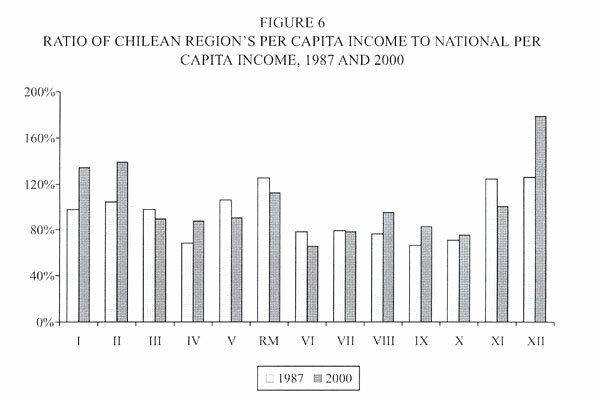 Duncan and Fuentes (2006, this issue) investigate per capita GDP and per capita income convergence among Chile's regions during 1960-2000, both in levels and in dispersion. Conventional convergence studies assume that under the null hypothesis of divergence the corresponding statistics have either asymptotic distributions or critical standard values. However, this is not the case in the presence of a unit root in the series, introducing serious inference problems. This paper applies unit-root tests recently developed for panel data that avoid the aforementioned problem. Other contributions to the preceding literature on regional convergence in Chile lie in using a revised database for GDP and income series and applying a non-parametric multimodality test to evaluate the presence of regional asymmetries. The results tend to support the presence of convergence in regional per capita GDP and per capita income levels. Compared to international evidence, regional convergence is relatively slow; the gap between poor and rich regions is closed in more than 80 years. However, convergence speed is higher when the authors control for the share of the mining sector in each region, which leads to regional differences in steady-state levels of per capita GDP and income. The evidence reported by the authors on convergence in dispersion is weaker, but their multimodality tests reject the existence of bimodalities or convergence clubs. Fuentes, Larraín, and Schmidt-Hebbel (2006, this issue) contribute to Chile's aggregate growth literature in two dimensions. First, the authors provide new estimates for the sources of Chilean growth and new measures for factor inputs and TFP levels during 1960-2005. Capital series are adjusted by utilization and labor employment series by hours worked and labor quality measures. Using a Cobb-Douglas function, the paper presents eight series for TFP based on alternative combinations of input measures. Then the authors provide econometric evidence on the determinants of TFP for the last half-century. The results suggest that, in addition to cyclical factors (approximated by the terms of trade and real exchange-rate undervaluation), TFP growth reflects efficiency gains from macroeconomic stabilization (measured by lower inflation) and microeconomic reforms (reflected by an index of structural reform progress). There is also evidence on significant interaction effects between macroeconomic and microeconomic factors in the dynamic behavior of TFP. The impact of microeconomic reforms on TFP is weaker (stronger) under conditions of high (low) macroeconomic instability. The converse is also true: macroeconomic stabilization yields larger gains in economic efficiency when the quality of microeconomic policies is higher. Macroeconomic stability has been largely attained in Chile, and hence it can be ruled out as a significant future growth factor. Therefore achieving high future TFP and GDP trend growth will be conditional on significant efforts in implementing further microeconomic and sector reforms in support of additional efficiency gains and major improvements in labor quality. Vergara and Rivero (2006, this issue) contribute to the understanding of sector-level TFP dynamics. This is the first study of sources of growth at economic-sector level in Chile, which is made possible by constructing new series for sector capital stocks (based on the perpetual inventory model), extending available series for 1986-2001. These new series are also a valuable contribution of the paper for the conduct of subsequent sector studies. The authors adjust factor series by capital utilization and labor quality, and then decompose the sources of growth for six sectors: manufacturing; electricity, gas and water; construction; retail trade, restaurants and hotels; transport and communications; and financial services. The results for the last years are consistent with the growth reduction observed during 1999-2003, with most sectors exhibiting negative TFP growth. For the full 1986-2001 period the authors show that the sector comprised by retail trade, restaurants, and hotels exhibited the highest productivity growth (2.7%), followed by financial services (1.4%) and transport and communications (1.2%). Manufacturing exhibited the lowest productivity growth, at a negative rate (-0.5%). The results of this paper support the findings of the international literature that IT-intensive sectors -in particular, retail trade- are the ones with the largest productivity expansion. Bergoeing and Repetto (2006, this issue) decompose the sources of growth for the manufacturing sector, using plant-level data from a large sample compiled by the National Survey of Manufacturing (ENIA) for 1980-2001. Once the authors have obtained TFP series, they analyze productivity dynamics identifying the effects of production reallocation (derived from substitution of production by efficient firms for production of inefficient firms) and within-plant efficiency changes (due to adoption of superior production methods and technologies). Working with plant-level -as opposed to aggregate data- allows identifying the two latter dimensions of productivity gains. The empirical results evidence large differences in TFP behavior, even among narrowly defined sectors. This reflects the study's key result that reallocation has accounted for most of the efficiency gains in manufacturing during 1980-2001. This leads the authors to conclude that barriers to efficient reallocation reduce aggregate efficiency and growth. Among the latter could be policy barriers like financial restrictions, international trade barriers, firm entry costs, inefficient bankruptcy procedures, bureaucratic red tape, an excessive tax burden, labor regulations, and lack of human capital for technology adoption. The latter policy distortions have static as well as dynamic effects, pushing the economy inside its production possibility frontier (the static efficiency loss) and delaying the adoption of new and better long-run technologies (the dynamic efficiency loss reflected in a slower extension of the frontier). Finally, in a study that complement the preceding paper, Navarro and Soto (2006, this issue) analyze the sources of shocks and determinants of labor productivity in the manufacturing sector in the 1979-2001 period, using data for 80 sectors from ENIA. They focus on the correlation between labor productivity and economic activity, an indicator of the nature of shocks affecting firms, and provide an analytical explanation to a long-standing puzzle: at the firm level there is significant and robust evidence of pro-cyclical correlation while at the aggregate level there is no correlation whatsoever. Pro-cyclical correlation indicates the predominance of supply-driven shocks (largely due to technology changes) as opposed to demand-driven shocks. The explanation highlights the role of aggregation biases that arise when using aggregate productivity series and distort the cross-industry correlation; sector heterogeneity in productivity levels is one cause for such biases. More important in biasing the results is the role of cross-industry productivity correlations that tend to offset the positive correlations observed at the industry level. Based on an econometric model, the authors provide evidence on the determinants of productivity changes. The results indicate that technology shocks account for most of productivity cycles in the 1979-2001 period (around 50%), thus supporting the supply shocks hypothesis as the main source of business cycles in Chile. The remaining productivity changes are explained by important reallocation effects between sectors of different productivity in the 1979-1985 period and the presence of increasing returns and market power in the 1986-2001 period. Variations in the utilization rates of capital and labor appear to be insignificant. Chile does not suffer from any shortage of reports on growth impediments and policy proposals to put the country on a faster development path. There is no lack of meetings and conferences on development issues put together by business associations, academic institutions, think tanks, the Central Bank or the government, complemented by a stream of studies, papers, and books on the subject. Scarcely a month goes by without a mission from an international institution eager to meet key players and specialists to obtain data and their views on the country's development limitations in order to write the corresponding institution's regular Chile report. Not all this activity is relevant to improve our understanding of Chile's growth prospects. I may add, at the peril danger of incurring in a colossal understatement, that considering the large quantity and wide dispersion of the studies and proposals that are put forward, not all are relevant for fostering Chile's growth prospects. Hence next I refer briefly to a selective sub-set of studies that are relevant and/or representative of current views on growth. In fact, I restrict the subsequent survey to a few academic studies with policy proposals on growth and to parts that are relevant to growth in the reports issued by international organizations and the campaign proposals put forward by the candidates in Chile's 2005-2006 presidential election. Finally, it is important to realize that the latter reports and proposals cover a wide range of development and growth impediments and therefore propose a correspondingly broad set of policy reforms and extensions. But they offer little guidance on the relative ranking and development impact of their proposals. The only way to assess the proposals' growth effectiveness -will they lift growth? By how much and for how long?- is in the light of economic theory and empirical studies, i.e., against the findings of the systematic studies reviewed in the three previous sections. I leave this evaluation to the reader. Among the reports issued by international institutions, the Economic Survey of Chile by the Organisation for Economic Co-operation and Development (OECD, 2005) is the one that focuses directly on Chile's long-term growth challenges, which is the subject of its first chapter. The report identifies four key areas of reform with significant impact for the growth potential of the economy. The largest long-term growth gains would be achieved by raising human capital, Chile's weakest growth determinant. This should be attained by raising the currently low educational standards to the level of the top performers among industrial countries and by raising the quality of labor training programs. The second proposal is to foster pro-competition policies in network industries (electricity, telecoms, and infrastructure). Boosting innovation should be an additional policy priority, based on cost-effective use of additional government funding that will come from the new mining tax, allocating it in a contestable, transparent manner; diffusing state-of-the-art general-purpose technologies; emphasizing support of applied research; and overcoming institutional fragmentation of government bodies and policies that support innovation. Finally, the OECD proposes to make labor markets more efficient by lifting restrictions on part-time work and sub-contracting; and subsidizing availability of affordable childcare and pre-school education to raise low female labor participation. The International Monetary Fund (IMF, 2005) also recognizes the importance of increasing human capital for achieving higher long-term growth rates. Progress should be achieved in raising pre-school coverage; increasing the quality of primary and secondary education; improving access of low-income students to tertiary education; and providing teachers with the right incentives by allowing larger pay differentiation according to their performance. Policy reforms are also proposed to raise innovation policies and labor-market flexibility. Health-care reform and streamlining and standardization of business procedures are identified by the IMF as additional policy challenges for boosting long-run growth. In an earlier report, the World Bank (World Bank, 2002) argues that policies should encourage a shift from growth currently based on factor accumulation to growth increasingly based on productivity gains. In order to achieve this, the World Bank proposes to focus more on policies aimed at raising the quality of human resources and knowledge, including adult education, labor training and skill development, and encouraging labor mobility. Improving the investment climate and strengthening government modernization is also advised. Finally, a previous report by Inter-American Development Bank (IADB, 2001) claims that development of new areas of competitiveness is key for improving potential growth in Chile. This should be the focus of policies aiming at adoption of clean technologies, international trade integration, infrastructure improvement, and human capital development. The Central Bank of Chile conducted during 2004 a research project on Chile's growth, comprised by empirical and policy research on Chile's growth prospects and challenges. The project summary in Fuentes and Schmidt-Hebbel (2004) identifies four areas of policy proposals, based on individual studies cited subsequently. Tokman (2005) focuses on education to raise human capital, proposing to revise of government subsidies to public and privately-provided primary and secondary education; improve curricula of teacher's university education; strengthen performance evaluation of teachers; and raise government subsidies to pre-school education. Benavente (2005) assesses ways to foster innovation and technological development, proposing streamlining and centralizing dispersed government programs in support of innovation with participation of private-sector R&D leaders; and developing government support of higher private-sector participation in R&D expenditure and development. Albagli (2005) identifies labor-market imperfections, proposing substitution of higher contributions to unemployment insurance for current labor dismissal payments based on years of service; lifting restrictions on part-time work and working-hour distribution; and subsidizing child care for working mothers. Finally, Aguirre et al. (2004) propose policy measures to improve public and private-sector efficiency by adopting government service management practices and performance evaluation similar to those prevalent in the private sector; privatizing public enterprises; revising the bankruptcy law; extending reform of the judicial system; and improving health reform. 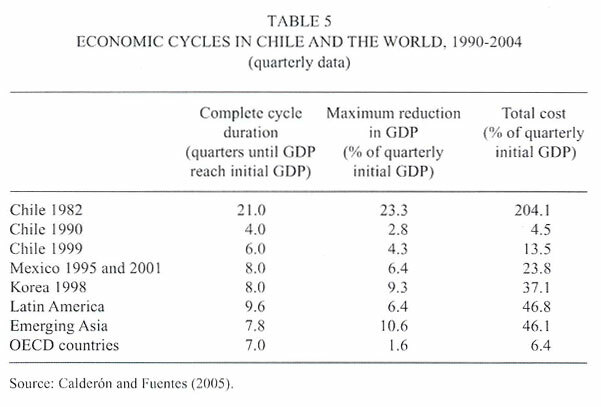 De Gregorio (2005) conducts an extensive review of Chile's growth determinants and prospects. The study identifies four areas of structural weakness where policy improvements could contribute to higher: low aggregate R&D expenditure and its low share devoted to private-sector applied R&D spending; high income inequality; low quality of education; and low intra-regional (LAC) trade. Finally, the author argues for further progress in microeconomic and regulatory reforms, by improving competition policies and raising accountability of regulatory agencies and public enterprises. The latter was particularly true in the recent 2005-2006 presidential elections, where the programs representing three of four first-round candidates -those that commanded more than 90% of the popular vote- proposed similar policies for strengthening growth. In the following, I will refer briefly to the three latter programs. I will leave out the fourth program, as there is very little common ground between the latter and the other three programs,24 as well as between the fourth program and the studies on Chile's growth that I have reviewed in this article. The program of Michelle Bachelet (Bachelet, 2005), Chile's President since March 2006, includes a significant body of policy proposals and reforms with potential growth impact.25 On education, Bachelet proposes to raise coverage of pre-school coverage and university education, establish education subsidies for low-income families, and improve the quality of education (by extending the school day, revising school curricula, reducing class size, subsidizing rural school transport, improving public school management and accountability, and upgrading teachers' skills and knowledge). On employment and labor markets, the program endorses more labor market flexibility (widening options for part-time and flex-time contracts) but also calls for more employment protection and legal protection against anti-union practices. Higher female labor participation is to be achieved by the aforementioned subsidies to pre-school education, complemented by subsidies to training programs targeted at labor market reinsertion of mothers; higher youth employment is targeted by raising subsidies for training and hiring young workers, introducing more flexible part-time contracts for students, and subsidizing pension contributions of youngsters. Further labor-market measures include extending coverage of unemployment insurance, adopting a counter-cyclical employment program, and extending training programs. To strengthen macroeconomic stability (and in this way also to raise long-term growth), Bachelet proposes to reinforce the counter-cyclical nature of current policies by maintaining the structural fiscal surplus rule, adopting the aforementioned counter-cyclical employment program, issuing international liabilities denominated in local currency, and investing in public international assets that provide hedging against adverse shocks. On innovation and technology, the program proposes development of a national innovation system focused on raising expenditure on R&D and lifting its effectiveness, based on private-public partnerships, stronger evaluation of government subsidies to R&D, and more effective attraction of multi-national firms to invest in Chile. Another growth-oriented area in the Bachelet program is geared at competition policies and entrepreneurship, proposing stronger government competition (anti-trust) institutions and a review of M&A policies. For micro enterprises and SMEs, the program pledges more general support, subsidies for developing entrepreneurial capabilities, support of R&D, better access to financing, and tax return simplification. Bachelet proposes to continue the development of capital markets by improving corporate governance and takeovers among private firms, extending best corporate-governance practice to public enterprises, consolidating supervision in one government supervisory authority, revising competition barriers in financial-service industries, and support internationalization of Chile's financial system and capital markets. Finally, the program includes proposals for reforming government that include improving the quality and accountability of government services, up-grading qualification and evaluation of government staff, implementing policies to prevent corruption, and extending transparency of government decisions. The presidential program of Sebastián Piñera (Piñera, 2005) also includes a significant number of policy proposals with potential growth effects. This program also starts with the shortcomings of education, proposing to raise pre-school coverage; raise the quality of education (by increasing student subsidies and up-grading school curricula); improve training, incentives, and evaluation of school teachers; revise government evaluation and management of public primary and secondary education; and raise access to higher education and improve its quality control. On employment and labor markets, Piñera proposes to introduce more labor market flexibility (by reforming labor dismissal payments and allowing more flexible contracts on the distribution of working hours over time) and to establish an independent National Employment Council for regulation and supervision of employment conditions. On government reform, the program proposes restructuring and mergers of ministries and government services to attain government objectives more effectively; adoption of private-sector management practices by government services; devolution of government functions to the private initiatives and institutions; up-grading of professional capabilities of government staff; raise SOE accountability and transparency and separate their dependence from ministries; SOE privatization (by selling shares to pension funds) with sales revenue invested in a government fund for financing anti-poverty programs; raise accountability and transparency of government services, government decisions, government resource allocation; and strengthen budgetary autonomy and decision-making at the municipal level, while raising transparency of municipal management to reduce opportunities for corruption at the local level. The program proposes maintaining the counter-cyclical structural fiscal budget rule, but gradually reducing the current 1%-of-GDP surplus to zero. On competition policies and support of entrepreneurship, Piñera proposes stronger and more autonomous government competition (anti-trust) institutions; elimination of excessive regulation and bureaucratic requirements for starting new enterprises; and provision of more financial, managerial, and technical support o micro and SMEs. The program targets R&D support by raising aggregate R&D expenditure; promoting applied R&D by private firms; and easing patent registration. Finally, the presidential program of Joaquín Lavín (Talleres Bicentenario, 2005) also considers a significant body of policy proposals with significant potential growth consequences. For further capital market development, the program proposes intensifying international financial integration through bilateral agreements; extending access to credit and banking services; lowering taxes on financial transactions; and revising excessive financial regulation. On R&D the Lavín program is geared at restructuring government R&D spending and institutions; making Chile more attractive for establishing foreign R&D centers; promoting joint initiatives between universities and firms; extending significantly the number of graduate scholarships and locally trained PhDs; reducing barriers to technology and software imports; and supporting patent registration. The program establishes support of entrepreneurship, market competition, and SOE development by lowering (eliminating) corporate income taxes on reinvested profits of all firms (SOEs); reducing excessive market regulation; minimizing government arbitrariness in setting public-service tariffs and issuing government permits; providing competition (anti-trust) institutions with more independence and financial resources; strengthening M&A legislation; supporting SMEs by eliminating initial bureaucratic requirements for start-ups and subsidizing their access to credit. On government reform, Lavín proposes modernizing government management, including competitive hiring of government managers based on performance-based contracts; providing management autonomy to public services; introducing transparency and accountability in government procurement and government service management; adopting modern corporate government practices in government service; putting SOE minority share packages on sale; reintroduce rigorous social project evaluation of government expenditure programs; and impose profitability requirements on SOEs. To strengthen macroeconomic stability, the program proposes to recapitalize the Central Bank and raise its managerial transparency; and maintain the structural public sector balance rule introducing changes in its calculation method. On employment and labor markets, Lavín proposes to make employment contract and workplace conditions subject to collective bargaining instead of government regulation; establish more effective control and enforcement of regulations on labor contracts and workplace conditions; support of female employment by subsidizing pre-school education and adopting more flexible labor contracts; support of youth employment by adopting more flexible contracts and exemption from payroll contributions. The program's proposals for education comprise devolution of education system and management decisions to school boards and principals; increase in pre-school education by providing subsidies to individual students; improve design of primary and secondary education subsidies; improve quality of technical education; and restructuring higher education, its quality control, and its coverage. On the basis of exceptional high growth observed during Chile's "golden period of growth" (the average annual 7.6% GDP growth rate recorded during 1985-1997), it is often stated - not only by the press and politicians - that Chile's growth potential is or should be in the range of 6-7% per year. But the latter inference is incorrect because it is based on a period that starts at a very weak and ends at a very strong cyclical position, as I have discussed above. Current estimates for potential GDP trend growth - an unobserved stochastic variable - are closer to 5%. De Gregorio (2005) summarizes medium-term GDP growth projections from ten different studies provided for varying periods that span from one to ten years, roughly within the 2000-2010 decade, which average 5% with a moderately low dispersion. Estimates of the independent panel of experts consulted by the Ministry of Finance for the 2006 budget for the structural budget surplus rule and current Central Bank estimates confirm medium-term GDP growth projections that are close to 5%. Moreover, as stated above, Chile's actual long-term GDP growth, reflected in its most recent cyclically balanced period, from 1990 to 2005, has been 5.3%, equivalent to 4.1% per capita GDP growth. Per capita growth of 4% per year, sustained over a long time period, represents a fundamental break with Chile's past. Recall that average per capita GDP has been only 1.7% during Chile's full history as an independent nation (from 1810 to 2005), implying an average per capita GDP growth of 1.5% during 1810-1990. Likewise, Chile's 4% per capita growth figure exceeds significantly per capita growth recorded by the world at large and most developing and industrial economies and regions, excepting East Asia and the Pacific's performance. Will Chile be able to sustain high annual per capita growth -say, at 4%- for a sustained period into the future? This "million-dollar" question lacks an unconditional answer. However, the research studies and policy proposals reviewed in this article offer some guidance. First, Chile's current combination of structural, policy, and institutional strengths and weaknesses will carry its economy on its current growth path for some years to come, barring major shocks and abstracting from cyclical deviations from trend growth. Second, Chile's exceptional strengths in macroeconomic policy and stability, and in the quality and development of its institutions, are confirmed in international country rankings, time and again. 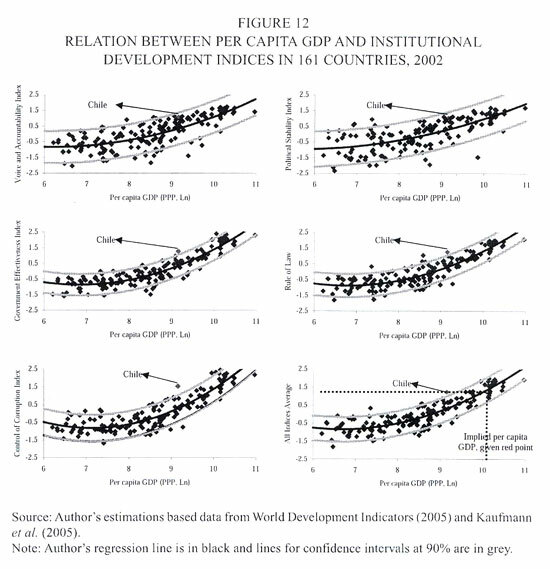 Correlating six indicators of institutional development with per capita GDP levels in a world sample, I confirm that Chile is an outlier from the cross-country regression, exhibiting levels of institutional development that are (often significantly) higher than those associated to its per capita GDP level (Figure 12). This evidence substantiates a positive outlook for future growth. Third, Chile's weaknesses are entrenched but generally acknowledged, giving rise to the policy reform proposals reviewed in section 4 and substantiated by the research summarized in sections 1-3 and 5. Therefore I will end this article by referring briefly to the five major reform areas that, in my view, offer the largest payoffs in high future growth. Not surprisingly, this view is correlated- but not perfectly so -with the main proposals that I have reviewed above. This will excuse me for not restating the details on the abovementioned proposals. The first area where substantial reform is required is education. The current shortcomings of Chile's education system are widely recognized and transparently reflected in the very unsatisfactory performance of students and the general population in several internationally applied tests of educational and general skills. The proposals for reform are spelled out in many studies and government programs and aim at a quantum shift in education coverage and quality over the next decade. A second Achilles heel in Chile's development strategy is the low aggregate level and the low return of the country's R&D expenditure. Several reforms of government institutions and programs have been advocated to raise aggregate R&D expenditure levels and make them more effective through better design and implementation of government support, geared at stronger public-private partnership and reorientation toward applied R&D conducted by the private sector. On factor markets, reform consensus is thinner than in the preceding areas. On labor markets, reform proposals for more labor-market flexibility depend on their perceived tradeoff with employment protection. Yet Chile's high average or natural unemployment rate, close to 8%, suggests that there should be room for raising labor-market flexibility to bring natural employment down and make human-capital investment more profitable. On financial intermediation and capital markets, reform proposals are geared at attaining more market competition, wider population access to banking services, and better risk diversification both within Chile and internationally. Government reform represents a major challenge -because of its political-economy and implementation difficulties. However, a quantum leap in efficiency, transparency, and accountability of government management and service delivery is a necessary condition for sustained development. Government reform, complemented by radical privatization of all remaining SOEs and market-friendly improvements in government regulation and competition policies applied to goods and asset markets, would make a major contribution to private sector-led growth. As fifth major requirement for achieving sustained high growth, I list the defeat of poverty. Lifting the ca. 20% share of poor Chileans out of poverty does have a major impact on their welfare. Beyond the latter, it will raise growth by contributing to more trust, security, and social peace in Chile, hence raising the returns to investments in physical capital, human capital, innovation, and technology. Two final observations are in order. More than in other fields of human action, the devil is in the details of good policy design and implementation. The world is plagued by well-intended policy actions with unintended but disastrous consequences (Easterly, 2001). Hence significant efforts and resources should be devoted to develop the blueprints and implementation of policy reforms. Last but certainly not least, the growth payoff from synergies and complementarities of well-designed and implemented policy reforms can be very large, as documented by Gallego and Loayza (2002) and Fuentes et al. (2006) for Chile. Take the case of major and joint reform progress in the areas of education, labor markets, and poverty reduction, combined with progress in law enforcement. As a result of the latter, a growing share of better educated people with larger employment opportunities will be lifted out of poverty and will live a more productive life with a reduced alternative cost of working - crime. This outcome will have positive social externalities, reflected in more social cohesion and trust, less crime, and more security, raising investment and growth even further. *I thank Álvaro Aguirre for outstanding, proficient assistance and insightful discussions in preparing this paper. This article reflects the view of its author and does not necessarily represent those of the Central Bank of Chile or its Board members. 1Phelps (1935) reviews Latin American policies implemented after the Great Depression, arguing that the rise in trade tariffs in developed countries was a critical factor for their implementation in the region. Ellsworth (1945) analyzes domestic policies following the Great Depression (abandoning the Gold Standard, introduction of exchange-rate controls, and increase of import duties, among others), presenting a favorable view of the industrialization strategy. 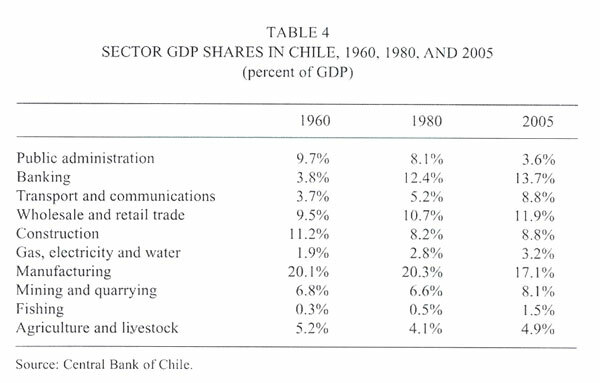 Mamalakis (1976) provides a historical analysis of Chilean economic growth between independence and the early 1970s. 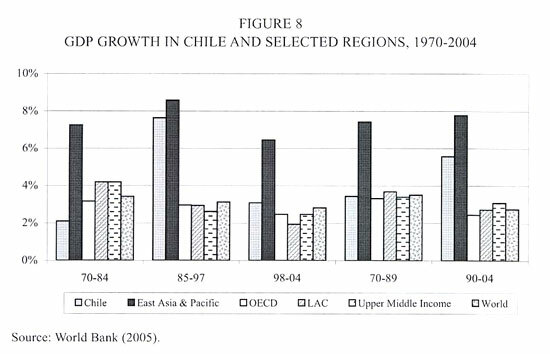 Hurtado (1988) reviews Chile's growth performance from 1930 to the 1980s. Lüders (1998) assesses Chile's comparative economic performance from 1810 through 1995. 2Country choice was determined by data availability and relevance for Chile. 3For example, Chile's performance improves vis-à-vis Spain between 1880 and 1940 but deteriorates vis-à-vis Japan during the same time span. 4Lüders (1998) argues that the break between convergence and divergence occurred towards the end of the 19th century and the beginning of the 20th century, and not as a result of the Great Depression. 5Due to lack of available data, the GDP series relative to the world and LAC start only in 1960. 6The size of Chile's standard deviation of growth is typically larger than the standard deviations of growth of any region because country-specific shocks are smoothened out in large regions. 7However, Chile was not an outlier from the estimated cross-country relation in any of the three considered periods. 8See Soto and Torche (2004), Díaz and Meller (2004), Anríquez and Fuentes (2001), Araya and Oyarzún (2001), Aroca and Bosch (2000), Díaz and Herrera (1999), Morandé et al. (1997), and Fuentes (1997). For an earlier analysis of regional growth see Tagle (1968). 9Adverse foreign conditions and domestic mismanagement are certainly behind Chile's bad performance during 1970-1984. Another negative factor could be temporary up-front costs of structural reforms adopted since the mid-1970s, like trade reform. For example, Rauch (1997), based on a model where trade reform raises long-run growth but reduces short-term growth due to adjustment costs, argues that trade reforms explains Chile's low growth between 1973 and 1984. 10See Barro and Sala-i-Martin (1995) for a cross-country growth decomposition. 11Among the sources-of-growth studies conducted for Chile during the last 40 years are Chumacero and Fuentes (2005), Vergara and Rivero (2005), Vergara (2005), Loayza et al. (2004), De Gregorio (2005), Beyer and Vergara (2002), Gallego and Loayza (2002), Corbo and Tessada (2002), Contreras and García (2002), Bergoeing and Morandé (2002), Coeymans (1999), Roldós (1997), Rojas et al. (1997), Edwards (1983), Schmidt-Hebbel (1981), Elias (1978), Selowsky (1969), Bruton (1967), and Harberger and Selowsky (1966). 12See Sachs (2003) for the role of geographic factors, Sachs and Warner (1999) for natural resources, and Easterly et al. (1993) for luck. 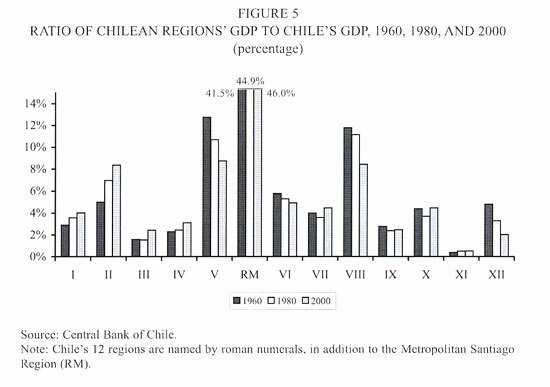 13See Fuentes and Mies (2005), Vergara (2005), and De Gregorio (2005), for a general analysis of growth in Chile, and Hernández and Parro (2005), Albagli (2005), Benavente (2005), and Tokman (2005), as well as the chapters in Beyer and Vergara (2001), Larraín and Vergara (2000), and Cortázar and Vial (1998), for more detailed analysis in specific areas with implications for Chile's aggregate growth. 14Another early study, Solimano (1989), presents evidence suggesting that macroeconomic stability was an essential component for the recovery of investment in the 1980s. 15For a review of macroeconomic reforms and its effects see Corbo and Fischer (1994), Dornbusch and Edwards (1994), Edwards (1994, 1995), Fontaine (1989), Hachette (1992), Mujica (1992) and Wisecarver (1992). 16Mamalakis and Reynolds (1965) analyzed the effects of the import-substituting strategy and the distortionary policies on Chile's economy and Harberger (1970) presented a more general view of development problems affecting Chile and Latin America in the 1960s. 17Among the earlier studies are the following. Behrman (1976) analyzes the effects of exchange rate regimes and liberalization episodes on growth during the Post-War period in Chile. Coeymans (1978) and Schmidt-Hebbel (1981) estimate the effects of the 1970's tariff liberalization on welfare and economic growth. Figueroa and Letelier (1994) measure the contribution of trade openness to GDP growth. 18See Hinojosa-Ojeda et al. (1997), Harrison et al. (1997), Brown et al. (1998), and Coeymans and Larraín (1994). 19Davis (1964) provides an early estimation of the effects of a parametric (i.e., non-structural) reform of Chile's state pay-as-you-go pension system on national income, by reducing labor market distortions. 20Fontaine (1997) analyzes development of an information system for decision-making on public investment projects and government capital budgeting. 21Their basic specification includes initial per capita GDP, initial average years of schooling, life expectancy, domestic credit to the private sector, government consumption, black market premium, openness, and terms-of-trade shocks. Their sample extends from 1970 to 1998. 22See Edwards and Cox Edwards (1988), and Condon et al. (1985) for a detailed analysis of the factors that triggered the crisis of 1982 in Chile. 23The large influence of economists holding advanced degrees from abroad in shaping elections and policies in Chile is also reflected in their prominent role among presidential candidates and their advisors, cabinet ministers, senators, Central Bank board members and staff, and public-sector managers and staff. 24One example of the stark contrast between the fourth presidential program and the other three programs can be found in the assessment of free trade. Bachelet's program -representative of the three majority programs - asserts that (we) "
a small percentage of population has systematically appropriated political power, economic strength and technology. This demolishing process of national sovereignty and independence attains its highest expression in the Free Trade Agreements or specifically in the intention of imposing a Free Trade Agreement of the Americas" (Juntos Podemos, 2005, p. 2, author's translation). 25This program, as well as the two others summarized below, includes a wide range of proposals on social and productive sectors that may have some aggregate growth impact. However, in my review I omit references to the latter, focusing only on policy proposals with potential impact on aggregate factor accumulation or aggregate efficiency gains.